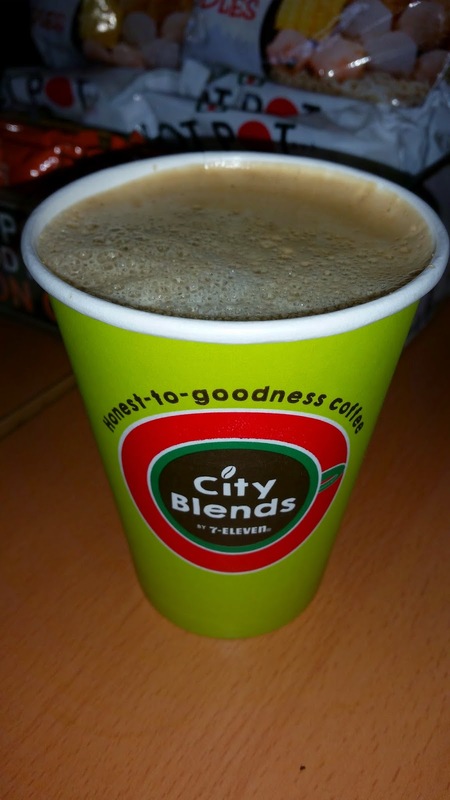 7-Eleven has just launched its newest coffee brand, City Blends. They promise a fresh, rich and flavorful coffee and they did deliver as I was able to drink the French Vanilla flavor. It also comes in Hershey's Dark Chocolate and Mochaccino flavor but I prefer to not have chocolate so I just had one flavor. Each cup is made with 100% Arabica beans so there is no doubt the coffee is freshly made, every single time. Don't forget to use the hashtags #711CItyBlends and #Honestly on your social media posts whenever you post a picture of you enjoying a cup of City Blends coffee. During February 11 to 24, 2015, 7-Eleven is having a special Valentine's promo that allows you to experience the City Blends coffee at a very affordable price. For only P20, you can choose from the 3 limited edition 8oz. Honest Cups: Single, Taken, or It's Complicated. The cups even come with a blank space where you can explain your status. 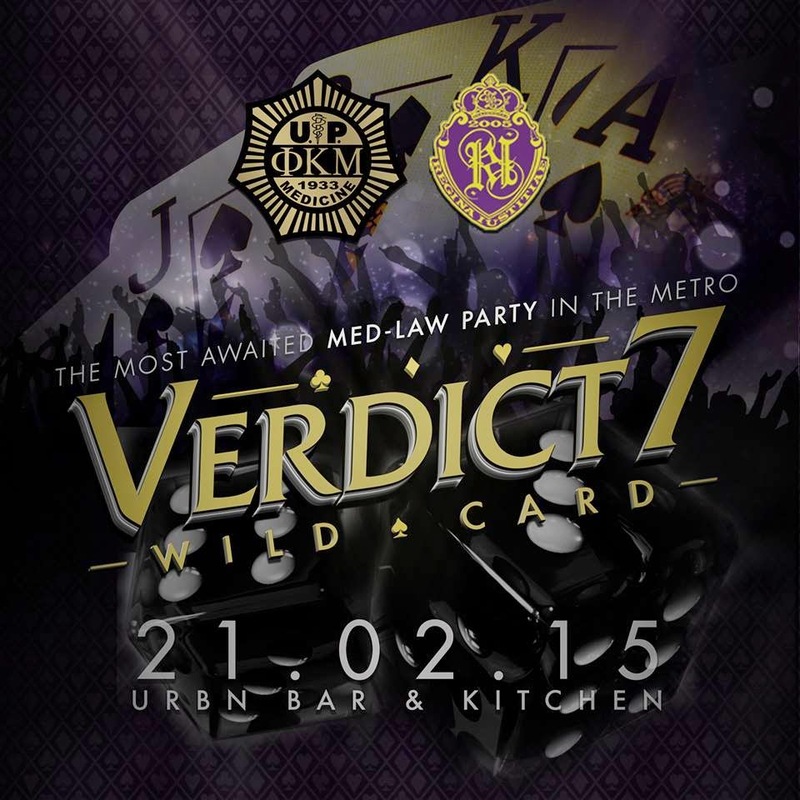 Aldous ate the World is proud to become a media sponsor to the most awaited med-law party in town for 7 years in a row: vERdict: Wild Card. This event is brought to you by Regina Iustitiae Society of Ateneo Law School and Phi Kappa Mu Fraternity of UP College of Medicine. Proceeds of this event will be used in Regina Iustitiae's 2015 Bar Operations. Check out the official Facebook for details on how to get tickets. Door charge is at P350. See you all at Urbn Bar & Kitchen this Saturday, 8 PM! 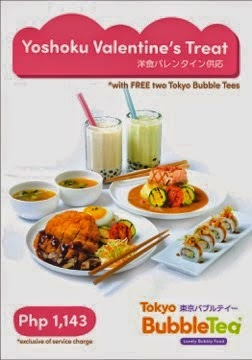 This Heart's season, Tokyo Bubble Tea gives you a chance to enjoy an affordable and tummy-filling meal at the same time. Behold the Yoshoku Valentine's Treat that comes with two servings of Miso Soup, one special Maki that can't be found on their menu, two Yoshoku big plates of your choosing, two medium milk teas of your choosing and 2 Tokyo Bubble tees of your choosing. 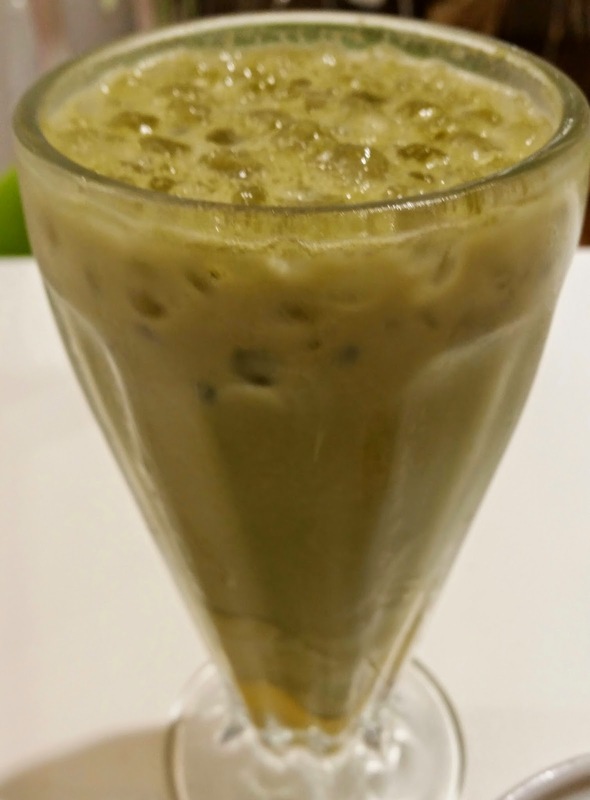 For my drink, I chose the Japanse Green Milk tea with Egg Pudding. I actually have Zel with me for this food review and she was more than willing to share her opinions for all of my faithful readers out there. One good thing I like about Tokyo Bubble Tea is that they give you the option of having Splenda as the sugar for your drink and that's exactly what I had on order to avoid the overload of sweetness in the drink. 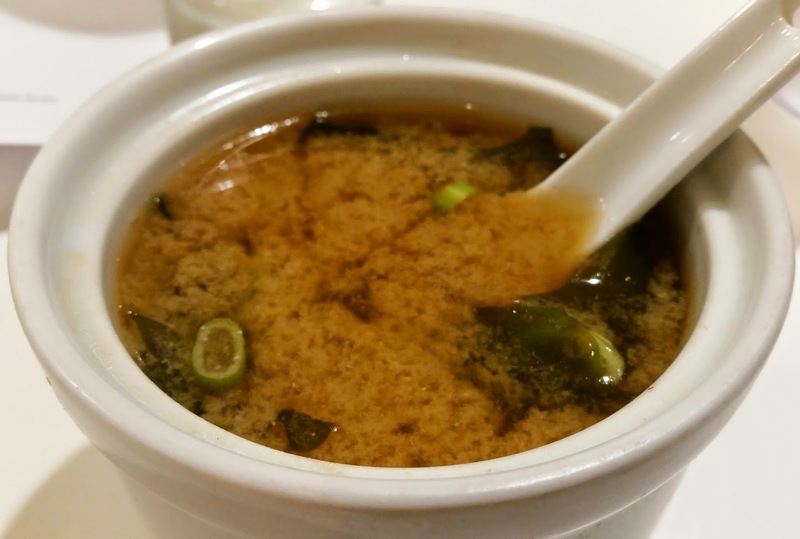 The Miso Soup is too creamy. In fact, I noticed that something is always moving and it had a lot of greens which is always a good thing. This was also when our Tokyo Bubble t-shirts arrived. We had the options of choosing between their mascots Sakura, Midori and Ichiban. All the t-shirts are really cute and they also have a promo where the couple would take a photo of themselves wearing the shirts and the best one gets to dine at the restaurant for free. 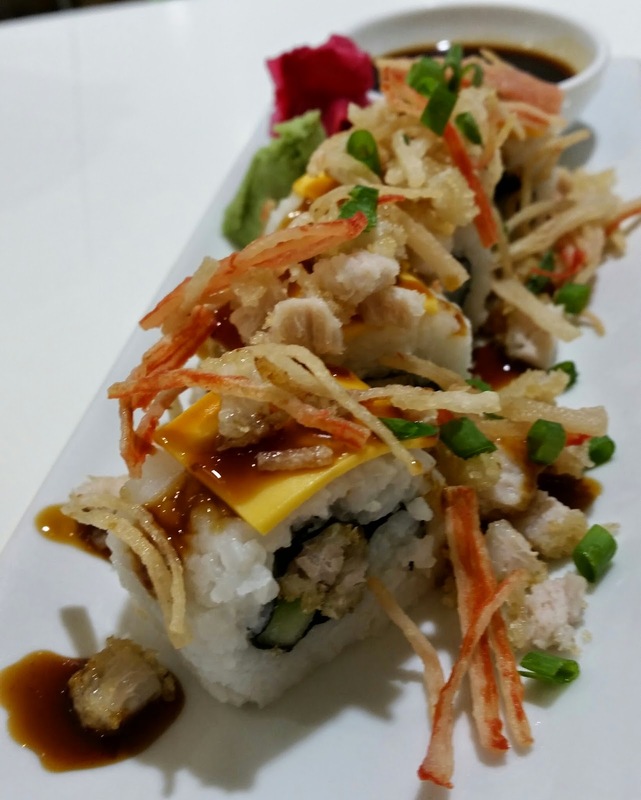 The surprise maki that's not on their menu is the Cripsy Pork Maki. It is filled with crispy pork, cheddar cheese, cucumber and rice. It is one maki that you probably won't see anywhere else. 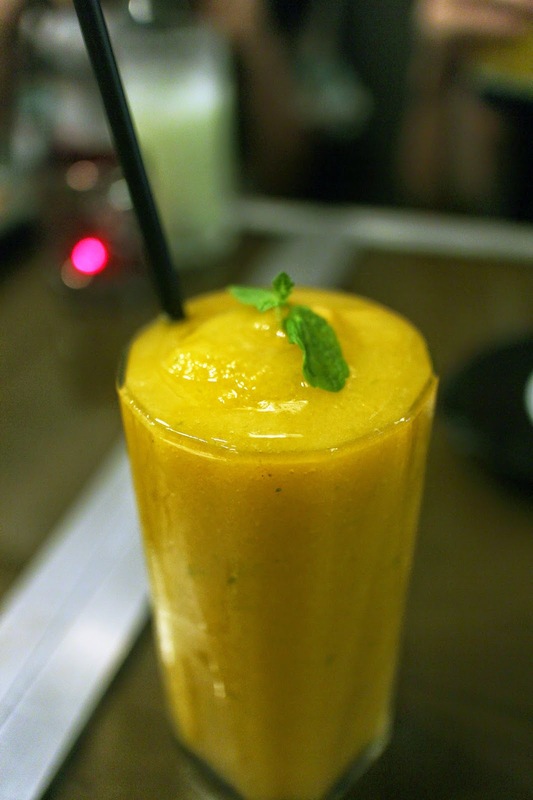 I have to hand it over to Tokyo Bubble Tea for coming up with a recipe for this one. I enjoyed it a lot especially the crispiness of the pork. For the two Yoshoku big plates, I chose the two that had a star in them: Hamburg Steak with Demi Glace and 1/4 Japanese Chicken Leg Rice. Zel said that the burger had a little too much flavor in it and she's right. I honestly thought there was too much pepper in the mushroom sauce. The size of the burger is good enough for two people or myself alone. Since both of us are not that fond of rice, we chose mashed potato instead. It turned out to be a good choice as we ended up ignoring the coleslaw. The 1/4 Japanese Chicken Leg is cooked perfectly according to Zel and she is so right. It came with ginger sauce which made it even more oily when it is added to the garlic rice. We felt that this would be a lot better if it came with plain rice. The chicken was indeed fried up to the point that you would want a lot more of it. 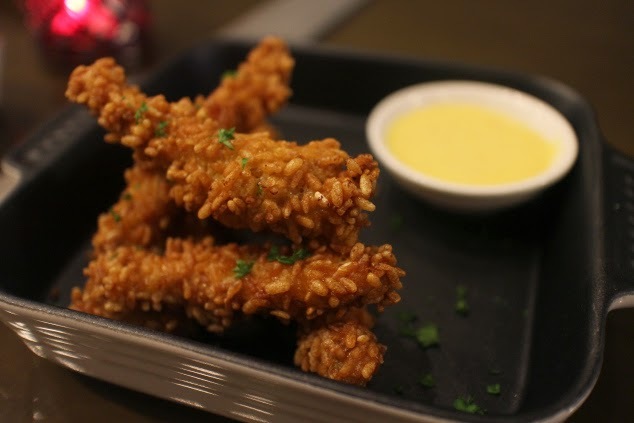 It is hard to compare it to the fried chickens of fried chicken themed restaurants. The promo runs from February 12 to March 8 only so head over to your nearest Tokyo Bubble Tea branch and avail of this exciting promo. "Not all those who wander are lost" is one of those common Instagram profile descriptions that never seem to get old. It is used by people who love to explore places. 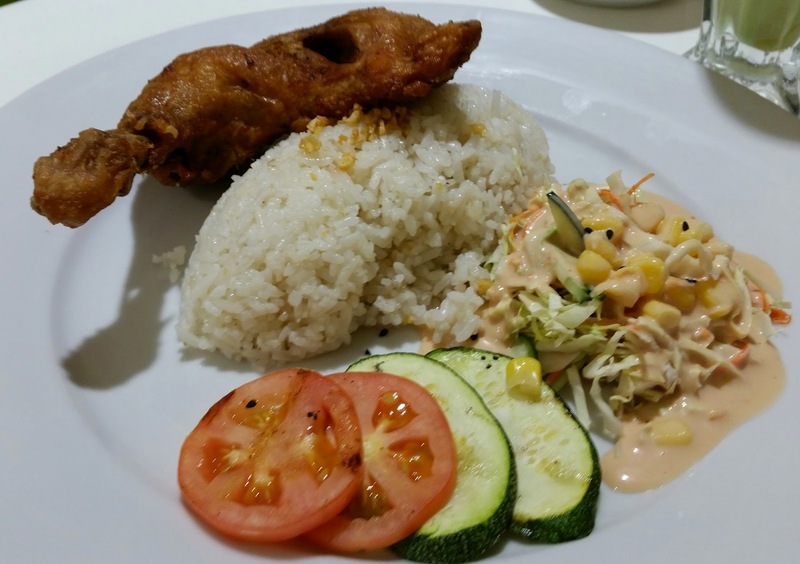 The good thing about new Maginhawa Street restaurant The Pilgrim (defined as one who travels to a sacred place for religious reasons) is you don't have to travel to far places just to eat food there because they make it easier for you by serving them all here. I am slowly turning over a new leaf as I am getting myself to become addicted to salad. 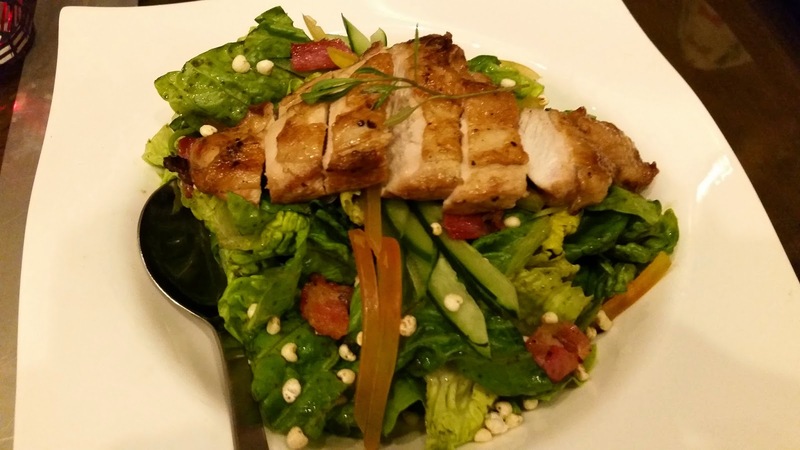 The grilled chicken was cooked to perfection on top of the basil tarragon dressing. I was glad most of the bloggers ignored the salad as I was the one who got this plate empty. The appetizers filled our table in "Swoosh!" fashion but I advise to overlook that as Chef Dennis Tan assures us they are all made from scratch. 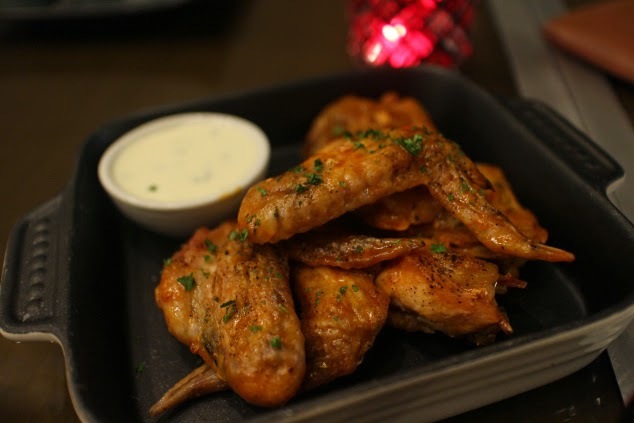 We are all used to eating the Chicken Fingers and Chicken Wings with rice and that would also be a great idea here. I was expecting the chicken wings to be spicy but it was apparently not which is a good thing for me. 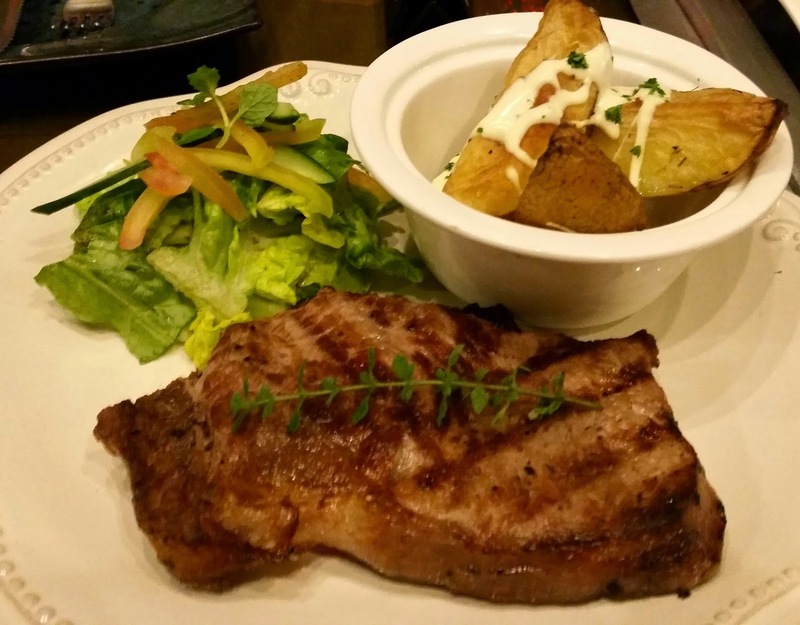 I'm sure them mates all the way from the Gold Coast would love some of Chef Dennis' Aussie Rib Eye Steak. I thought they should have given us a larger kitchen knife to slice this steak but I guess I am not used to that task. I loved the potato wedges that came with it too as I wish there was more of that. 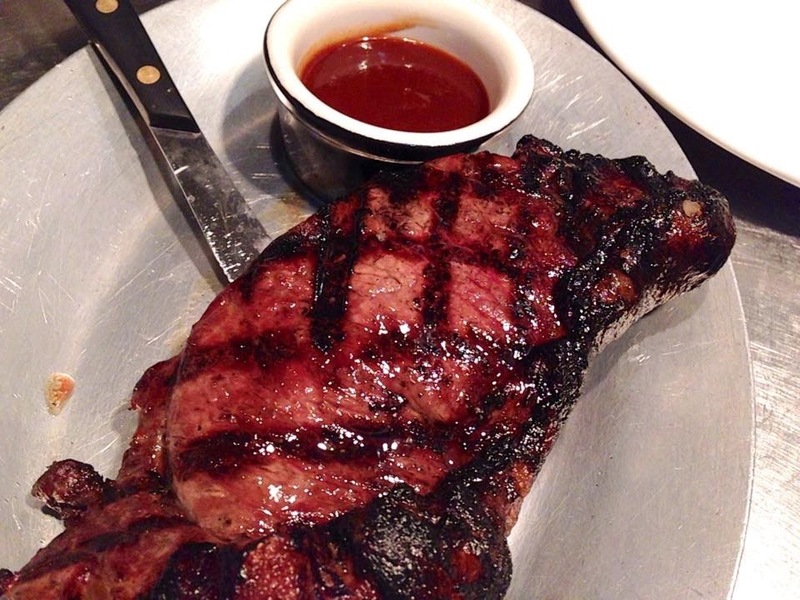 The steak is easily chewable and that is always good news. That foo' Mr. T would have been proud if he could only travel all the way here to sample this Baby Back Ribs named after him. 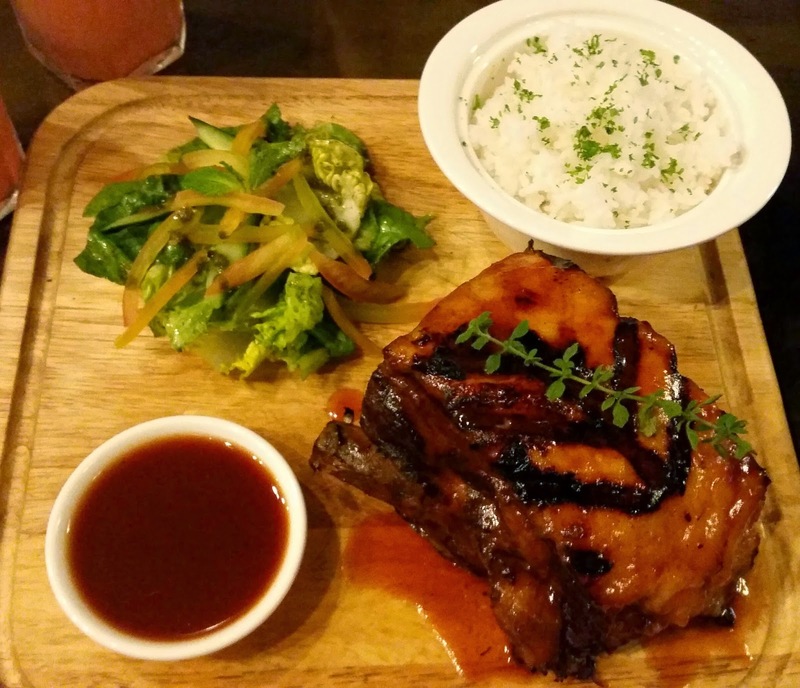 The meat is tender and the barbeque sauce is just to die for. Once he takes one bite out of it, I'm sure he will invite Chef Dennis Tan to the mutha' A-Team. I wanted another one of this dish soooooo bad. 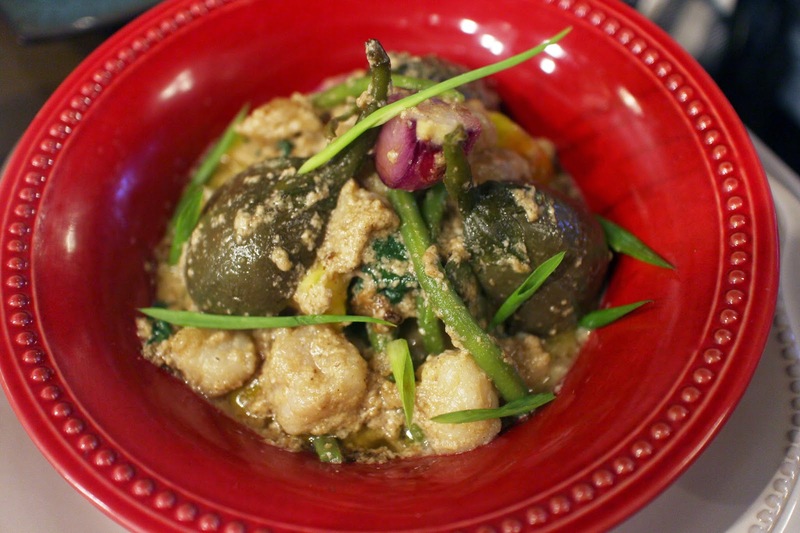 You got the choice between fish and chicken for the Khmer Green Curry and we got the fish. Once again, it is not spicy and the sauce stemming from all that vegetables is something to put on the rice. For me, a dish with lots of vegetables is always good. When you go to the Pilgrim, check out their healthy fruit shakes. I actually got to try all of the shakes since I was so thirsty and I loved the combination of fruits especially the Stabilizer since it has mango, carrot and mint. A great blend of fruits indeed! 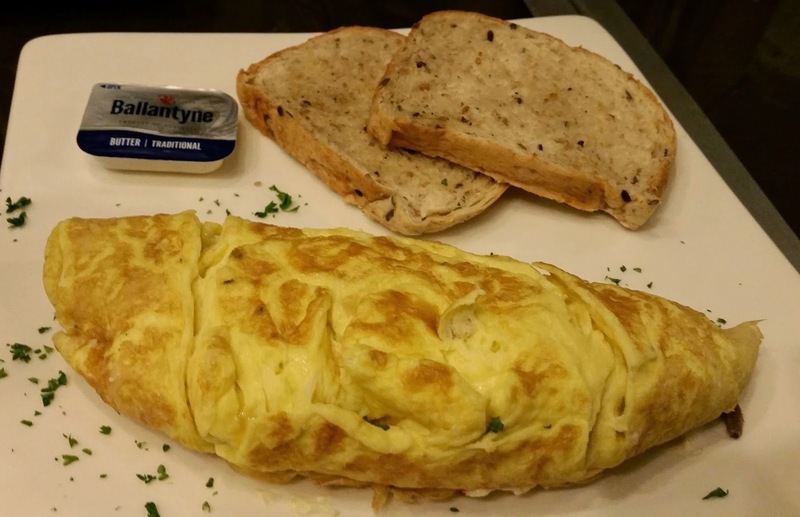 The sight of an omelette makes my heart melt so it is no surprise I loved their omelette and it only helped that it came with freshly toasted bread and butter. They have a Create Your Own Omelette and this one came with jalapeno, spinach, tomato and cream cheese. I had Dennis choose the ingredients for this omelette and I have to hand it to him. It was a winner. 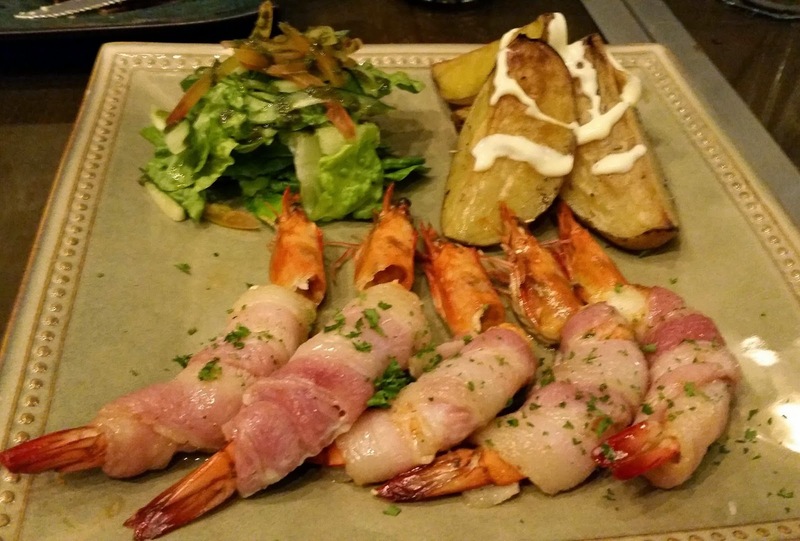 The best dish of the night has got to be the bacon wrapped prawns. After my first bite, I said "Oh f*ck!". I just had to have another serving of this as the mini salad and french fries complimented it perfectly. It is just too addicting and you won't be able to blame yourself if it tickles your taste buds in more ways than one. Chef Diane DiMeo is a hero after my very own eyes. She realized there's not much steakhouses in Brooklyn so she opened one together with David Kelleran and another partner who shall remain silent in the form of Hook & Cleaver. 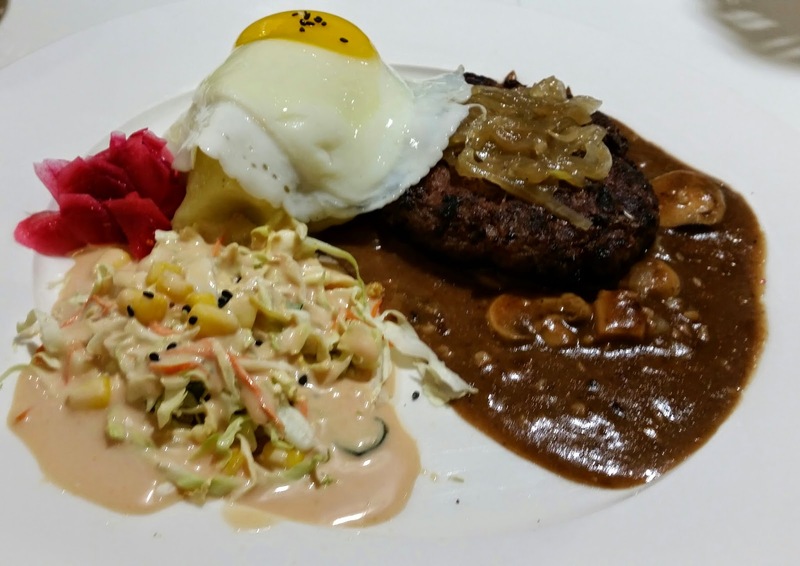 It is a beefsteak club that also serves seafood and other meat. Of course, they are open during late night for those who like to hang out at this place. 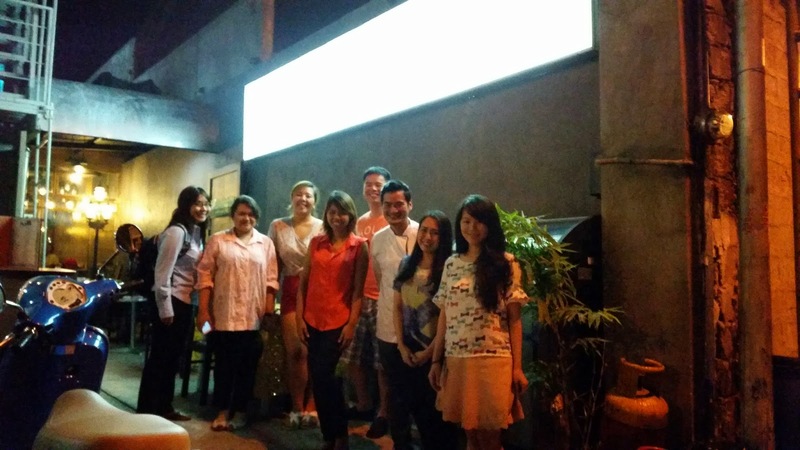 They are open Thursdays to Saturdays, 5PM to 4AM. 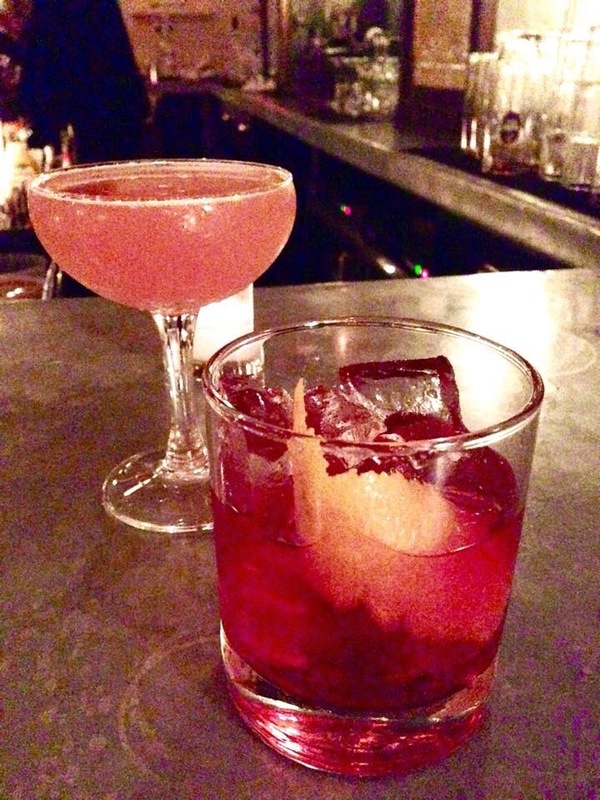 Whiskeys, steaks, chops, bourbons and classic cocktails will all be served. All steaks are grilled when they are ordered and served naked. They come with sides of the customer's choosing and a bottle of Hook & Cleaver steak sauce. Steak lovers can now rejoice. Hook & Cleaver has arrived! Thanks to Chef Diane DiMeo for the pictures!